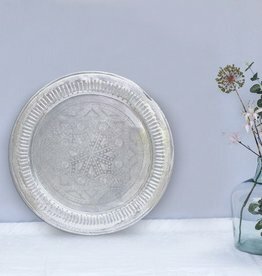 Handcrafted old moroccan vintage trays - simply pure. The beautiful original old moroccan tea trays get worldwide more and more popularity. Each generous sized tea tray is individual and unique. They are made from aluminium and have been cleaned and restored without removing the attractive patination that only develops over time. However as always, there are time worn marks which are an inherent part of the beautiful character of these trays. Lightweight and easy to move around they make stunning display pieces and provide a wonderful piece to serve your guests from.